This is my maiden blog post in June. First things first, I would like to wish all my Muslim readers a very happy Ramadan. May this month bring you and your family good health and the utmost in peace and prosperity. For those of you who are not sure as to what Ramadan is, It is actually the ninth month of the Islamic calendar. During this month, Muslims worldwide observe a month of fasting and this annual observance is regarded as one of the Five Pillars of Islam. You can learn more about Ramadan, here. For the next succeeding 20 odd days, my alarm clock would be ringing out at odd hours. It can be 4 am or even 5 am. If it is some other month, I can’t think of me waking up just to have food. During Ramadan, it can happen though. Although Ramadan is a time for us to understand the pain of those unprivileged ones, yet Ramadan is also when food is being sold in abundance all over here in Singapore. Infact, it is the same for countries like Malaysia and Indonesia too. I am obsessed with eggplants, especially when roasted. These stuffed eggplants were the bomb. Eggplant halves were roasted to bring out it’s natural sugars. It is then topped with tangy tomato sauce and finally, some cheese to end it all. DELICIOUS and you can’t go wrong with this one. Although I added some beef in the tomato sauce, you can omit it for a vegetarian version. 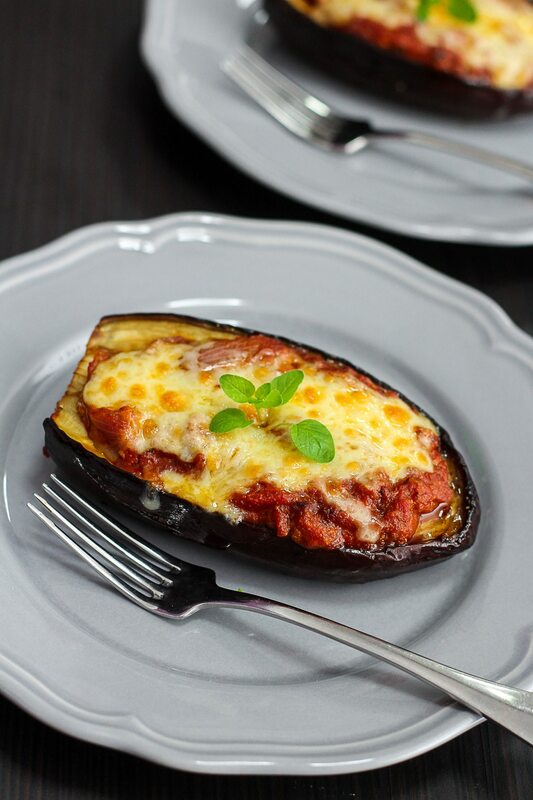 This Delicious Stuffed Eggplant is pretty healthy too! If I can have it my way, I shall eat this amazing grilled eggplant covered in melted cheese for the whole of Ramadan and I am serious about that. 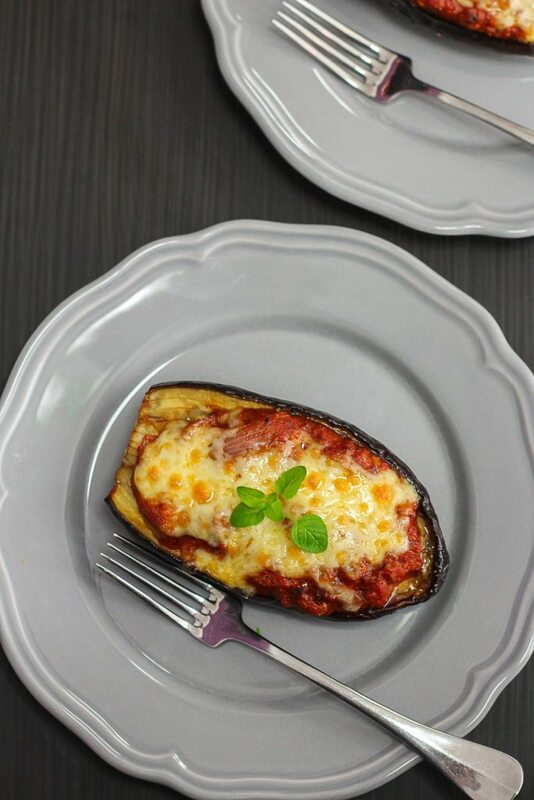 This eggplant not only makes a satisfying and easy dinner but also has a very pretty presentation for visiting guests as anything that looks like a boat, is a sure winner on the plate. ???? 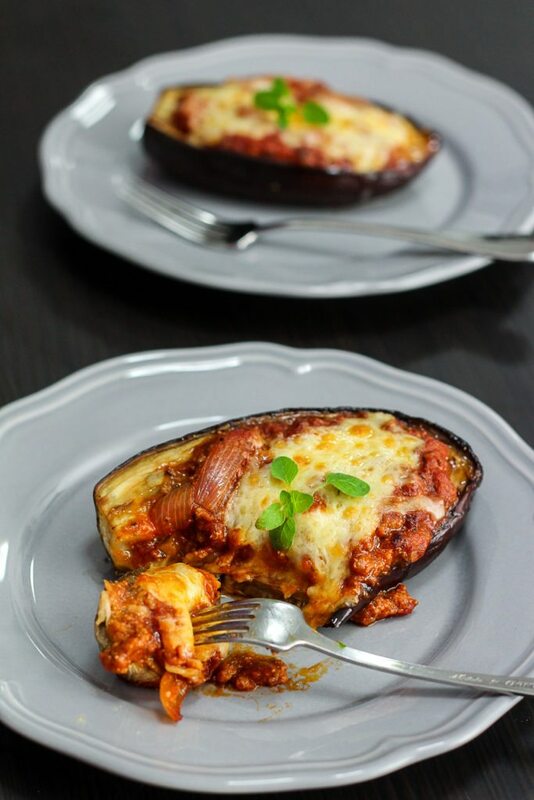 This Delicious Stuffed Eggplant makes a satisfying and easy dinner and it also makes a very pretty presentation for visiting guests. Cut the eggplants into halves and season with salt, black pepper and 1 tbsp of olive oil. Roast for about 20-30 minutes depending on the size of the eggplant. Meanwhile, in a medium saute pan heat 1 tablespoon olive oil over medium heat. Saute the onion, pepper and garlic for 2 minutes. Add the ground beef to the pan and saute until the beef begins to brown slightly. Pour in the chopped tomatoes and herbs. Season with salt, black pepper and ¼ tsp of Italian seasoning and cook till the sauce is thick. Once the eggplant is cooked, top with some sauce and a handful of cheese. Grill till the cheese melts. Could you please tell me on what temperature you roast the eggplant as well as the ounces of tomatoes needed (the size of the car)? I would love to try this recipe. What to serve with this scrumptious meal? Also temperature of oven and do I hollow out eggplant to stuff it? That would be about 1/2 pound of ground beef. You can use more if you like it more meaty. Oven temperature would be 170°C and no, you do not have to hollow out the eggplant as once it it baked, the eggplant is all soft in the center and it sinks for quite a bit. When roasting the eggplant; do you set it meat side down or outside skin side down on the cookie sheet? I had a hard time getting the eggplant done. Is there a trick to cooking it. I cooked this last night for myself and my partner and we both loved it! It’s the classic eggplant, tomato sauce, cheese combination but so very quick and easy to make. Definitely saving this one to my Favourite Recipe board and cooking again. 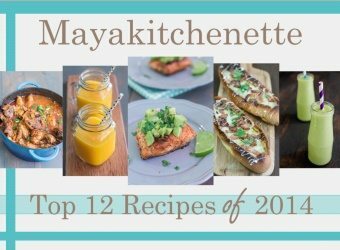 Thanks so much for sharing this yummy recipe, Maya. I made this again last night and have now given the recipe to my mother. Both times I used half and half ground beef and mushrooms rather than one or the other. This time I doubled the recipe so we are having it for dinner again tonight. So yummy! !